Argentine striker sent relatives a desperate message shortly before the light aircraft he was flying in disappeared over the English Channel. Hopes of finding Cardiff City striker Emiliano Sala alive were continuing to fade this morning, as it emerged the Argentine had sent relatives a desperate message shortly before the light aircraft he was flying in disappeared over the Channel. Floating objects have been found in the water, and police on the British island of Guernsey, which sits off the north coast of France, have warned the chances of the passengers surviving were "slim." 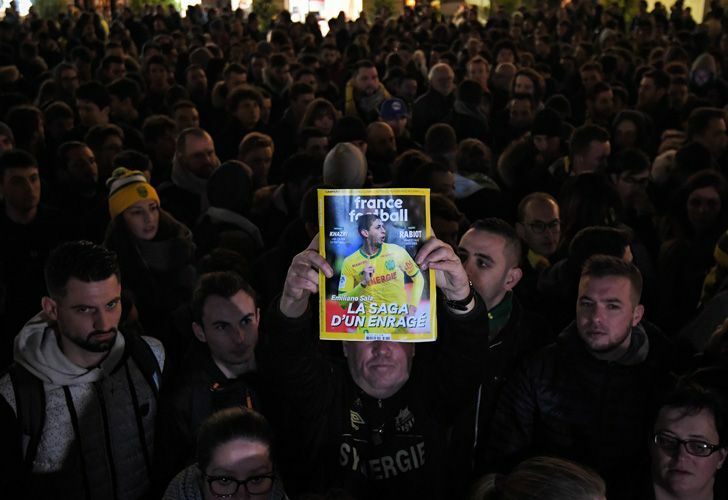 As rescuers in three planes and a helicopter scoured the sea, local media outlets reported that Sala sent a final message before the plane disappeared from radar around 20 kilometres (12 miles) north of Guernsey on Monday night. The player's mother, Mercedes, told local television channel C5N that the plane belonged to Cardiff chairman Mehmet Dalman, but he disputed the claim. Dalman said the club had offered to pay for his flight but Sala had "made his own arrangements." Sala, who signed with the Premier League club on Saturday from French Ligue 1 club Nantes for a reported fee of 17 million euros (US$19.3 million), was due to attend a training session with Cardiff on Tuesday. Rescuers on Tuesday said they had covered an area of 1,155 square miles (3,000 square-kilometre) in the Channel spotted "a number of floating objects in the water". In an update on Wednesday, Guernsey Coast Guard captain David Barker said there was "as yet no trace today of the missing aircraft". Rescuers' hopes rest in the possibility that the passengers are in a life raft, which has so far evaded detection. But Ken Fairbank, a former AAIB investigator, said it was "extremely unlikely now that anyone would be found alive, even assuming the aircraft made a controlled ditching". Fairbank said details were still sketchy but weather "may have been a factor... as it seems to have been overcast and with some mist at the Channel Islands airports." In Sala's hometown of Progreso, his father Horacio told the press that as "the hours go by and I don't know anything, it makes me fear the worst. We were in touch on Sunday. He was so happy that he was going there, to an even bigger club." The president of the club where the forward began his career said that these are "difficult hours" for all the locals. "There's great sadness and lots of uncertainty," San Martín de Progreso president Daniel Ribero said. "He's an example for all youth. A humble kid. He would always return to Progreso." The striker was in Cardiff last week to finalise the transfer, which was awaiting international clearance. The Premier League did not respond to questions about whether the transfer had been completed. A powerful and direct player, Sala equaled his career-best total of 12 goals – achieved in the past two seasons with Nantes – in 19 league games this season. He is fifth-highest scorer in the French Ligue 1, one behind Paris Saint-Germain forward Neymar, who is the world's most expensive player. Real Madrid coach Santiago Solari, also Argentine, said: "We feel great sadness of course and we send all the strength and love in the world to the relatives, close friends, and people that know him."